A little bit of aloha is coming to the mainland. This weekend on El Dorado beach, the 2nd annual Outrigger challenge will take place. 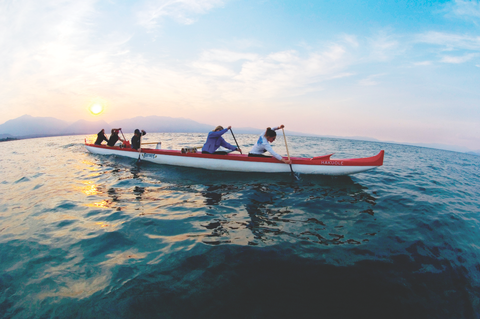 The Kawai’ulu ‘O Tahoe Outrigger Canoe Club will be putting on this fun spectator event. Races will start and end at El Dorado Beach in South Lake Tahoe, on the corner of Highway 50 and Lakeview Avenue. El Dorado Beach offers a spectator-friendly venue that will allow for lots of cheering and high energy — there is also a on-site cafe, free parking, restrooms, barbecues and picnic tables located in the Lakeview Commons upper areas. Saturday will feature the Keiki juniors 4-mile race and Novice 6-mile race at 8:30 a.m. along with the women’s, coed and men’s 10-mile races. The 10-mile races start with the women at 10:30 a.m. The Waterman’s Challenge is the main event on Sunday, a true test of strategy and skill in a fast-paced and dynamic three-leg relay with teams of six competing on standup paddleboards and OC-6 canoes. The challenge will start at 9:30 a.m. and take place entirely in front of El Dorado Beach for the public’s viewing pleasure. Get a Load of these Sunsets! Nevada Beach: Located about two miles east of the Nevada casinos on Elk Point Road, Nevada Beach is the ideal setting for a family barbecue at the beach. A wide, sandy shoreline leads down to the sapphire waters of Lake Tahoe. Charcoal barbecues and picnic tables dot the beach. The view across the lake to the West Shore and Desolation Wilderness is unsurpassed. And the view of the fireworks display is one of the best in town. Timber Cove Marina: Offering front row seating that fills up fast. The Tallac Historic Site: Off Emerald Bay Road, has an east-view perspective with nearby Baldwin Beach. For the more adventurous, the top of Mount Tallac offers a bird’s eye view of the fireworks extravaganza, but don’t forget your headlamp for the trek back down. Lakeview Commons/El Dorado Beach: Offering front row seating that fills up fast. Corner of Hwy 50 and Lakeview Ave.